‘Nine ladies dancing’ in a spectacular Christmas parade in Eltham last week. 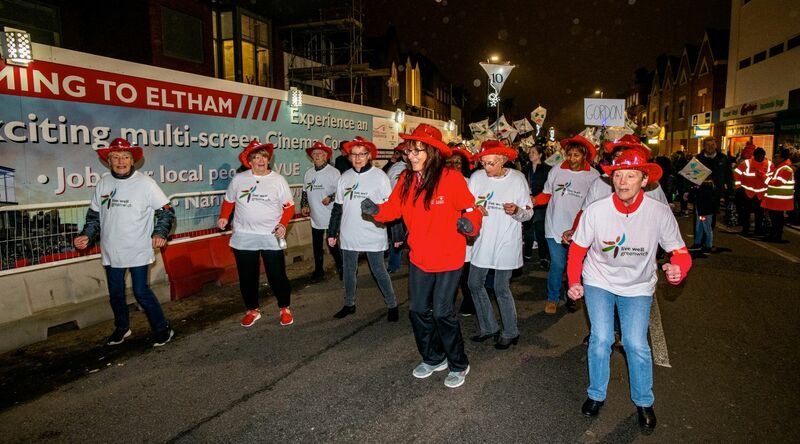 Helping kick off the borough’s annual Christmas celebrations last Thursday 15 November, a dedicated group of ladies from our ‘Active for Health’ programme hit the high street, alongside giant swans and golden rings, in a Twelve Days of Christmas themed parade through the town centre. All wrapped up and ready to face the cold – and the music – the troupe twisted and shuffled their way to musical hits, old and new, including “Boogie Shoes,” “Let’s Twist Again,” “Cotton Eyed Joe” and “Boom Boom Goes my Heart” – proving that there’s no need to move less now that the temperature has dropped. Sometimes the cold, dark days can have an effect on our mood and health, but keeping active through the winter months is one of the best ways to feel good. Not only does it help boost our immunity and protect us from catching cold or flu, being active on a regular basis can improve energy, fitness and mood – helping to keep those winter blues in check. Find top tips for staying well this winter. A great way to move more is to break up long periods of sitting, starting small and building up gradually at your own pace. Being active means getting your heart rate up, breathing faster and feeling warmer. Just 10 minutes of activity at a time can really help, eventually building up to 150 minutes a week. From climbing the stairs, cleaning the house and walking to the shops. It all counts! Line Dancing is just one of a whole range of free sessions available to adults who are interested in becoming more active. Whatever your ability, Active for Health has an activity to get you moving. From Tai Chi, Nordic Walking, chair based exercises and many more. Call the Live Well line FREE on 0800 470 4831 to speak to the Greenwich Get Active team about free and affordable activities to suit you, whatever your age or ability, this winter.